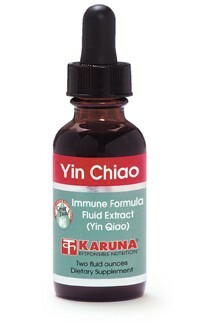 Yin Chiao (Yin Qiao) provides support to immune system defenses in the winter months. Yin Chiao supports not only the immune system's ability to monitor and react to external threats, but also modulates the strength of immune system responses. Yin Chiao is also very safe with no known major adverse effects. There are few formulas with the traditional use history of Yin Chiao, and investigation is beginning to understand the mechanisms of its effects. Yin Chiao may be used in conjunction with Western approaches to support systemic health. Forsythia and Lonicera, two critical components of Yin Chiao, are effective for supporting upper respiratory health (Chung Kuo Chung His I Chieh Ho Tsa Chieh 1992;12: 719-21). Gan cao or Chinese licorice, part of Yin Chiao, has activity against viral replication mechanisms (Lancet 2003;361:2045-6). The Yin Chiao herbs bo he (mint), schizonepeta, and prepared soybean are diaphoretics used traditionally to optimize the effectiveness of the immune response. Platycodon or balloon flower in Yin Chiao serves to direct other herbs in the formula upwards in the body and is an expectorant (Planta Med 2002; 68:221-5). Lophatherum has been used successfully in traditional Chinese medicine to help maintain upper respiratory health (Zhong Xi Yi Jie He Za Zhi 1990;10:686-8, 646). Suggested use for adults: One dropper full, 3 times daily, for two to three weeks, or as directed. Allow one week break before resuming. CAUTION: Seek professional medical advice if pregnant or nursing.